I want to just document something which I hope will make people’s lives a bit easier when it comes to using Unit Scaling in Max. I recently made the mistake (And I am sure it happens a lot) of forgetting about scale units in a project, which meant a few lost hours having to go back and re scale texture maps and the like. I also think that Unit Scaling is something that a lot of people find quite complicated considering there are two separate dialogue options for it. Anyway, I will cut to the chase. When setting up a project -always- make sure that your units are set up correctly. If your unit conversion is wrong then there is a knock off effect upon a lot of other things that are going on in your scene, from material coordinates to lighting falloff etc. 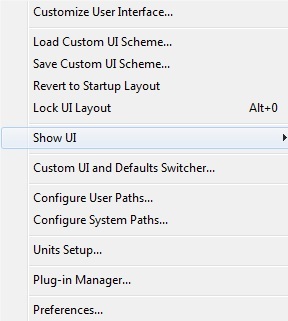 Firstly, it is found in the customize tab and in the Units Setup option you will find a twofold series of options. The first shown above are simply superficial options, they do not directly effect what each unit represents, they are an arbitrary label. 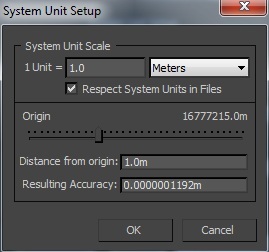 Regardless of what you pick here and even if it displays it in meters in the file, if in your system unit setup 1 unit = Feet, your file will always be measured in Feet. If you try and change this value in a scene after you starting building, you can get some very bad results, so if you do need to update a scene into a new unit size, create a fresh scene, set up the units and then merge the old scene into it and you should be able to avoid the horrible conversions that might occur on some objects. You will still need to change the size of some of your materials if you have used the option to use real world scale, as they will reflect your old conditions. Good information, not a lot of people know this. Google Units Switcher script for 3D Max, makes life a breeze when needing to change units!